With their back against the wall, Comcast is pulling out it’s well manicured, sharp claws in Fort Collins, Colorado. Voters will be asked to approve measure 2B on November 7th, which would allow the city to take steps toward establishing their own municipal telecommunications utility. In order to preserve the lack of competition, incumbent Internet access providers are on track to spending more during this election than has been spent on any other issue in Fort Collins’ history. Behind The Name Of "Citizen"
As we’ve come to see time and again, when a local community like Fort Collins takes steps to invest in the infrastructure they need for economic development, incumbents move in to prevent municipal efforts. Comcast and CenturyLink aren’t offering the types of connectivity that Fort Collins wants to progress, so the city has decided to ask the voters whether or not they feel a publicly owned broadband utility will meet their needs. In keeping with the usual modus operandi, out of the woodwork emerge lobbying groups that not-so-artfully mask incumbents like Comcast and CenturyLink. These groups are able to contribute large sums of money to whatever organization has been established, often in the form of a “citizens group,” to bombard local media with misinformation about municipal networks to try to convince voters to vote against the initiative. In Fort Collins, the “citizens group” happens to call itself Priorities of Fort Collins (PFC). $125,000 from the Colorado Cable Telecommunications Association (CCTA): This organization was the same mask Comcast used back in 2011 when it spent approximately $300,000 to stop a similar effort in Longmont. It wasn’t the first time they’ve used this tactic and it won’t be the last. $75,000 from the Citizens for a Sustainable Economy: The organization is tightly wound with the Fort Collins Chamber of Commerce and has been criticized in the past for questionable political spending. CSE’s President and the Chamber’s president are one and the same. Comcast, CenturyLink, and TDS are all members of the Chamber and so, by default, also members of CSE. $1,000 from the Colorado Telecommunications Association: CTA is another lobbying group that represents telephone companies and ISPs. TDS Telecom, which is also one of PFC’s public sponsors and a Fort Collins provider, belongs to CTA. "This isn't the first time we've seen this situation happen. CCTA also spent hundreds of thousands to preserve their monopoly in Longmont, but voters were savvy enough to ignore their lies." PFC has hid its true intentions - protecting the big incumbents - by trying to make voters believe that if they vote “yes” on 2B, they will effectively be eliminating the community’s ability to fund other infrastructure upgrades, such as roads and traffic improvements. In reality, the city has not committed to a specific business model or to spending any amount of funds. PFC tries to mislead Fort Collins voters by spreading the lie that a vote for 2B is a vote to spend $150 million. PFC is using the same old “burden on the taxpayer” argument; we see this tired lie at every corner. A substantial percentage of these projects are funded with revenue bonds and therefore deployment is paid for by subscribers. Fort Collins is considering two models, including offering retail services directly or working with a private partner. First the voters must choose to amend the city charter to allow the municipality to do either. Much like Fort Collins’ decision in 2015 to opt out of restrictive state law SB 152, supporting ballot measure 2B is a local vote for local authority. The heavy infusion of cash from the group backed by national ISPs is most certainly in response to the positive murmurs in Fort Collins in recent months. Business leaders and individuals - people with real names and faces - have written into the local press encouraging voters to support 2B so the city can choose from their options for better connectivity. The Fort Collins Citizens Broadband Committee, whose spending was dwarfed by the pro-cable and telco lobby, has been working to get the word out about how Fort Collins can move forward with high-quality gigabit connectivity. In order to correct local misinformation, the Committee has a helpful page that accurately breaks down the ballot question and describes the two options that the city is still considering. If Fort Collins is serious about being a place of equity and inclusivity where all schoolchildren can access the same learning tools at home, where workers can effortlessly telecommute instead of adding to Interstate 25 gridlock, and where shut-in and disabled residents can afford a vital link to the outside world, the city has ample incentive to offer its own gigabit internet service to a growing population with increasingly diverse needs. Private-sector broadband has served Fort Collins well, aside from shared gripes about customer service. But bringing the city's triple-bottom-line approach to broadband changes the conversation about what is possible. Voters in Fort Collins have a little less than two weeks to decide whether or not they can trust lying incumbents to deliver the services they need or to open up the possibilities for local self-reliance. 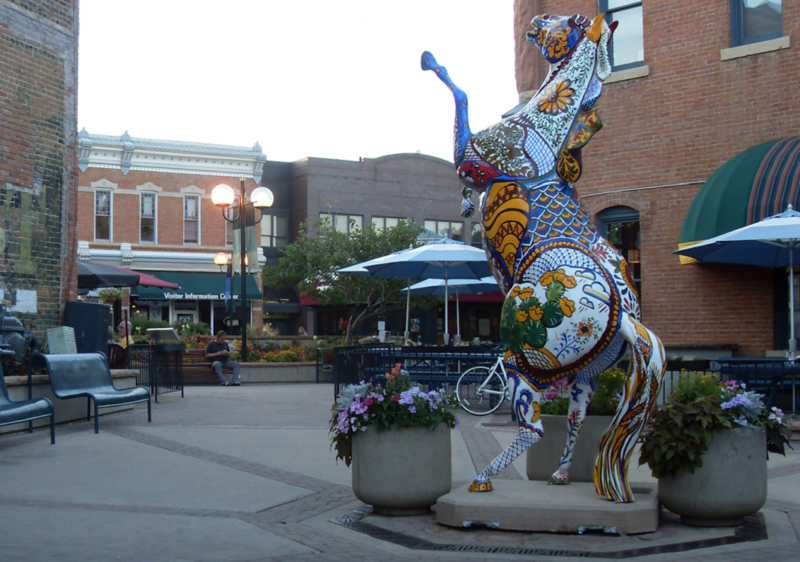 Image of Fort Collins Historic District by Wusel007 (Own work) [GFDL or CC BY-SA 3.0], via Wikimedia Commons.